Forty-five new factories will be set up in the Korean Export Processing Zone (KEPZ) to produce clothing products and shoes in the next three years. The new factories will be built by the YoungOne Corporation at the KEPZ located in the Chittagong district. KEPZ authorities say the factories will bring dynamism to the economy of southern Chittagong as they will generate nearly 300,000 job opportunities for the people in Anwara, Patia and Karnaphuli upazilas. Currently, the KEPZ houses 25 shoes and textile factories. 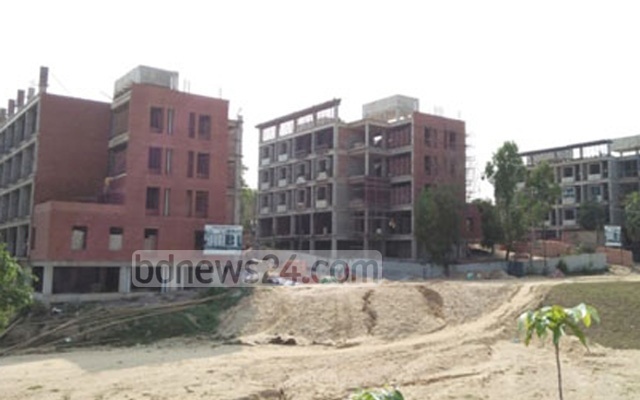 KEPZ Executive Director Mohammad Shahjahan told bdnews24.com that 45 more factories will be constructed. These factories will employ 100,000 directly and 300,000 indirectly, according to Shahjahan. Infrastructure construction and development work on four textile zones, an IT zone and a dormitory for women workers is underway at the KEPZ, he said. Though various international organisations have shown interest in investing in the KEPZ, they have been unable to construct factories due to legal complexities related to the land. “It is imperative to settle the land-related problem for attracting more foreign investment in the KEPZ,” said executive director. He said the issue on land transferring ownership should be resolved faster as it would pave the way for companies such as Samsung and LG to invest. The KEPZ in Chittagong’s Anwara and Karnaphuli upazilas is the largest private EPZ in the country, spanning 2,492 acres. The KEPZ, financed by the Korean YoungOne Corporation, was inaugurated by Prime Minister Sheikh Hasina on Aug 3, 1999. The organisation received environmental permissions on Nov 23, 2009. Fifty-two percent of the land was allocated for greenery and lakes, while 990 of the remaining 1,192 acres of land were allocated for factories and infrastructure. The remaining 202 acres were left for seasonal production. The first factory, the YoungOne Corporation’s Karnaphuli Shoe Industries, began production on Oct 2, 2011. Currently the KEPZ also houses factories for several YoungOne Corporation subsidiaries. Twenty-five units at these factories have begun production. The factories employ 20,000 workers, most of whom are locals. Karnaphuli Shoe and Garments Industries alone earned $200 million (Tk 17 billion) in exports in 2017 and is expected to export more this year, officials said.